Ever since I shifted to Bangalore, back in 2002, Hampi had always been on my bucket list of places to travel to. But for some reason, this never materialized, as I always had some emergency crop up. Hampi once a magnificent capital ruled by Vijayanagara Empire, the last Hindu Kingdom. Now echos a glorious past of how sophisticated the engineering feat was. From its memorial structures, temples, pillared halls to the sacred shrines. It is now recognized as a UNESCO World Heritage Site. I had the car pick me up, and drove down from Bangalore. The journey lasted about 6 hours. If you are driving, prefer taking the early hours of the morning to get to the resort in time for lunch. There is only one restaurant you come across called Hotel Kamat, so make the most of grabbing a bite there. The rest of the journey has pretty much got these street side vendors serving tea or snacks. The drive from Bangalore was a smooth one, time flew past fast. The drive was just a breath of fresh air, with massive boulders and unspoiled landscapes all the way. The phone’s network does go intermittent thought-out my journey. And there is little to no connectivity closer to or around the resort. Best time to visit Hampi is from October to March. Evolve Back Resorts, Hampi in Hampi, is just 4 km from the UNESCO World Heritage Site. Arriving at the Venue, is a massive fort entrance (still work in progress). Once you enter it, you drive down the stone-paved boulevard. And then you catch a glimpse of the splendid work of architecture. There it stands in all its glory and is a replica of the one of the famed palaces of the Vijayanagara Kingdom. It is an exclusive high-end luxury resort with just 45 rooms. The Indo-Islamic styled architecture with its historic grandeur blends in with modern-day luxury. There is history written all over. From the murals on the walls, to the lights and high ceilings. The stone boulders that sit in the lobby. There are 3 types of suites, and private pool villas – each with its common yet shared theme of luxury and tastefulness. Zenana – Palace Suite – This is the most luxurious suite at the resort. Located in the main palace and takes its inspiration from the Queen’s quarters. These spacious suites come with a separate living space, a dining area and a large bedroom. A private balcony, an en-suite bathroom and the feature is the private Jacuzzi. This is perfect for couples seeking a romantic getaway. Nilaya – Terrace Suite – Is another spacious suite that offers similar features as that of the Zenana Palace Suite. The addition here is a large private terrace. Ideal for couples who prefer extra space and privacy! Nivasa – Deluxe Suite – Similar take on the other two suites, here the size of the room is less, yet spacious. The bonus with this one is the private Jacuzzi is set up on the sit out area or balcony. Jal Mahal – These individual villas come with spacious living and sleeping area. The pièce de résistance of this villa is the open air shower. For those seeking a romantic getaway it cannot get any better than this. A private pool, Jaccuzi, a romantic gazebo and your own courtyard. The lovely staff greeted me with a courteous “Namaskara”. A warm smile, a refreshing welcome drink and a tikka added to the welcome charm. I received the itinerary for the rest of my stay. The resort had planned some trails with a tour guide. (more in the coming blog). Without any further ado I got whisked away to my room. Walking down the hall way, the size of the property dawned on me. It was huge and one could get lost as easy. I stayed at one of the Nivasa Deluxe Suite. The main highlight was the Infinity Pool view. I felt like a kid, at summer camp! The Suite was airy and had a rustic urban decor that exemplified royalty. The main highlight being the custom made 4 poster bed, that just called out to me to jump right in. Earthy colors all around, with natural sunlight that sneaked in to give it a dreamy look. The dark curtains help provide privacy and keep the light out for a more restful sleep. The room comes equipped with a television, a mini fridge. The resort follows the principle of “Responsible Luxury.” They do not have plastic water bottles in the room. Instead a Reverse Osmosis tap. This dispenses fresh drinking water anytime of the day. The bathroom is huge, I was just excited to dive into the Jacuzzi. But it had to wait, as I was too famished from my road trip and just wanted to freshen up and head for lunch. The resort has two restaurants. “Tuluva” named after the third Hindu Dynasty that ruled the Vijayanagara Empire). An all day dining restaurant serves up both Continental and Indian Cuisine. There is something to fulfill every demanding palate. This restaurant, serves various South Indian dishes related to Hampi. The bonus of dining here is the pool view and the gentle breeze that blows across. They serve a la carte, and buffet over the weekends. The other one called “Bahmani” serves up some lip smacking Nawabi Cuisine. And is open only for dinner. The setting was beautiful, it was a starry night. And the candle light dinner was just perfect after my rejuvenating massage. The Olympic sized infinity pool just rocks your senses. The stunning design resembles the aqueduct fed temple tanks of the Vijayanagar Empire. It is about 4 feet in dept, so no diving. The resort also has a separate pool for below 18 year old, which is next to the play room. It is just perfect to unwind and soak up the sun. I lay there immersed in the pool and drifted to another realm by the sheer beauty of the weather and the calm around me. I had the opportunity to swim and pose for photos in one of the private villas. As you can see this is just like a private island sojourn. 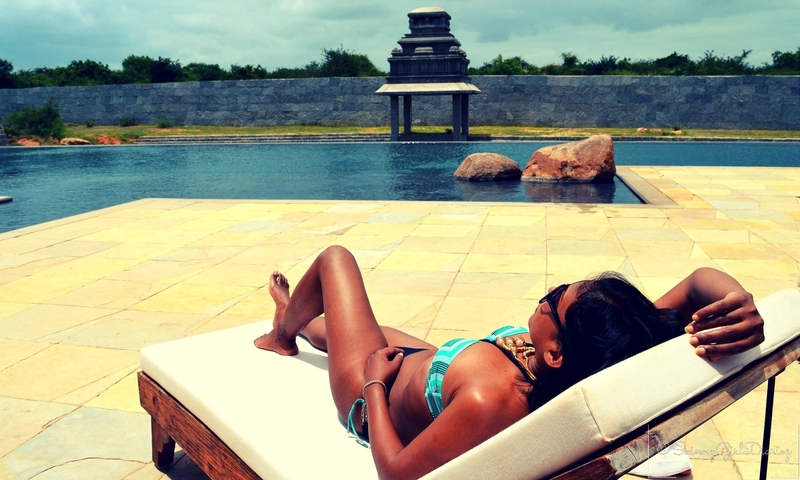 The photographs are from the main infinity pool by the Tuluva Restaurant, and the other is from one of the private pools at the Jay Mahal Villa. Lotus Mahal – The Ayurveda Spa – No weekend retreat is complete without an invigorating Spa. The Ayurveda Spa, harnesses the ancient techniques to heal the body. The experience is bound to leave you rejuvenated and revitalized. The treatments vary from herbal baths, oil massages, to beauty treatments. I loved the tranquil setting, it was regal. The rooms were bright and the pond flowing outside gave it a refreshing feel and a sense of calm. After filling in the form, and talking to the therapist. I told them I was an insomniac and was just exhausted. My treatment was the infamous body massage called Abhyanga. Two therapists, an hour, where the entire body gets massaged using herbal medicated oils. The Abhyanga improves tissue strength and blood circulation, helps induce sleep and removes toxins. Post the massage, I had to sit in this wooden box, an ancient steamer for about 15mins. My head stuck out, so it was a bit weird but a fun experience. I was also given two tablets to take before bed time, to clean the toxins from the inside. Next up, was an Ayurveda facial called Soundaryavardhini. I am not one who gets around getting a facial, the sheer though of it being an Ayurveda massage tempted me to proceed. Benefit of this treatment is the herbal ingredients used help remove dead skin. Reviving the skin tone and leaving you with a healthy glow. I had the masseurs take a pic of me(the last image below). Underneath the white sheet is a tub of hot water, I was sweating in no time. Any toxins left had dripped away. This treatment has two therapists and total time taken is an hour and half. Me sweating it out with a facial! Evolve Back Resorts, Hampi is the next upcoming holiday destination. In the coming months, the external work should get completed. My experience with Evolve Back Resorts, Hampi has to be the best so far. I fell in love with Hampi, and was happy I finally got to visit this place. As a solo traveler, I had a great time to reflect back and not have a cares in the world. The staff each and everyone always had a smile on their face and assist me with anything I needed. Each time you are bound to pass a staff member around the resort, they greet with “Namaskara”. By the end I too went around greeting everyone the same way. The tour guide Bhanu, hats off to him for being my official photographer and his first time with a DSLR that too. Resident Manager Abhishek, he ensure my stay was at ease. This is a legendary place, and perfect for couples and families alike. I left feeling rejuvenated. I will go back there once again, this time with some friends. The best parting gift was a box of spices from their own plantations. A memorable and thoughtful gift indeed! This place has lot of monkeys that visit daily rummaging for food. So ensure to keep all the doors and windows locked at all time. During my stay I encountered them. But lucky for me I was indoors. (Did you Know? Evolve Back Resorts won the ‘Best Designed’ category at the Outlook Traveller India’s Boutique Hotel Awards 2016). If you have stayed at this property, would love to hear your thoughts, feel free to leave your comments below.